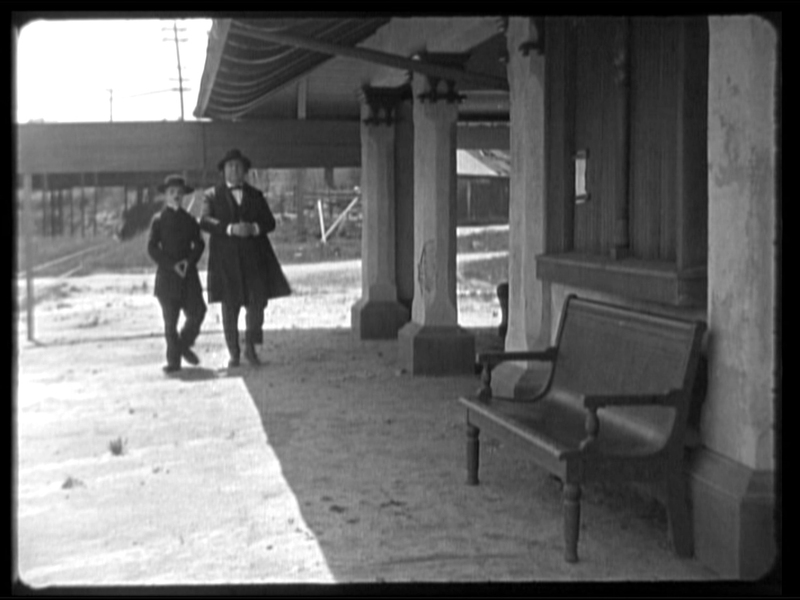 Charlie beside the Saugus station in The Pilgrim and as it appears in Suddenly. 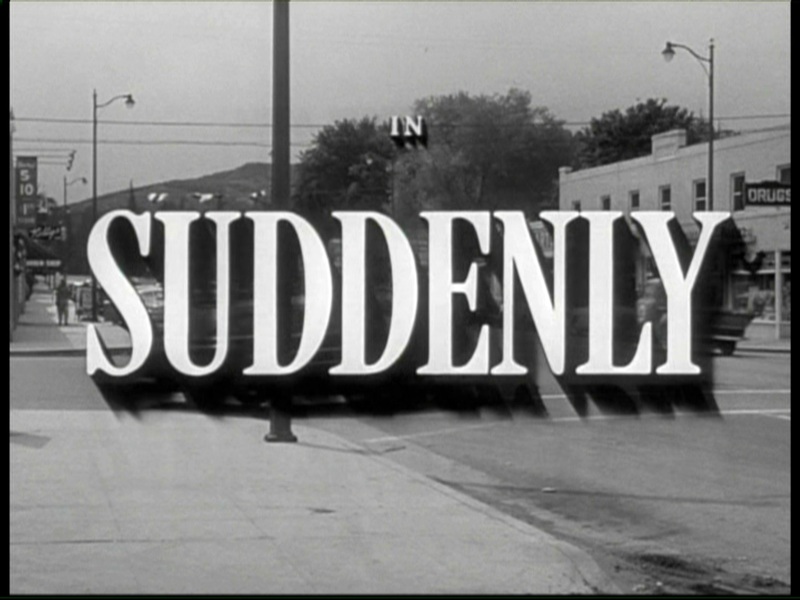 The unusual movie title refers to the fictional town “Suddenly” in which that movie takes place. Classic movies filmed on location provide historic views of the past. Moreover, later films shot at a popular location also provide fresh perspectives of earlier movies filmed at the same spot. 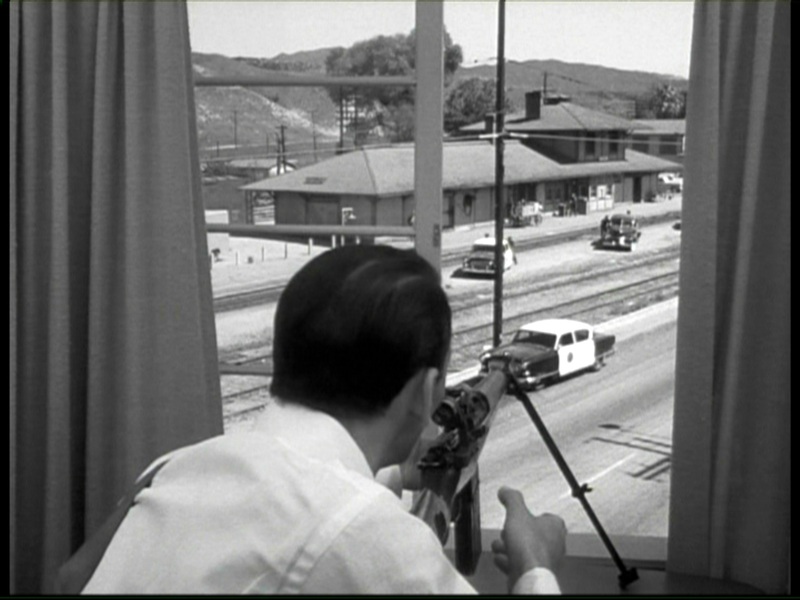 A case in point is the Saugus train station appearing both in Charlie Chaplin’s The Pilgrim (1923), and later in the 1954 Frank Sinatra hostage-sniper drama Suddenly. 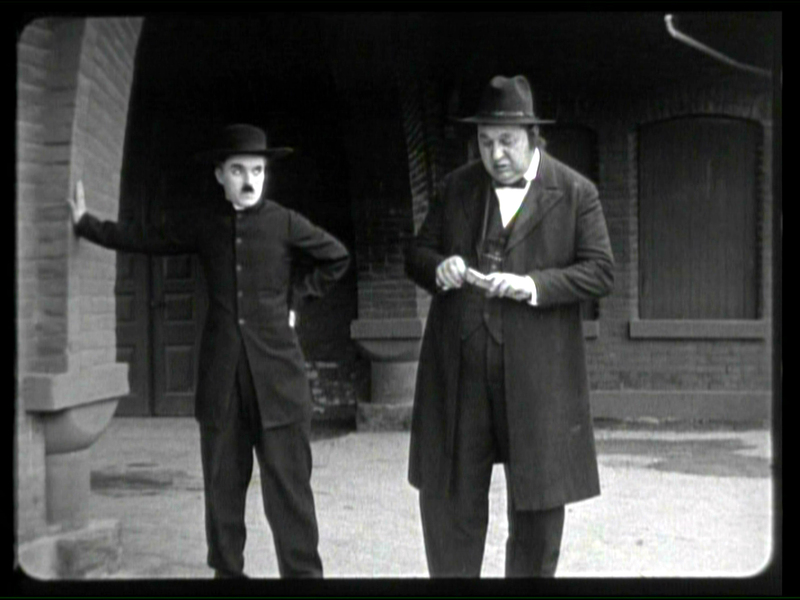 Although the station still exists (relocated to a nearby park a few miles away), it was difficult finding vintage photos of the station in its original setting at the time I was writing about The Pilgrim for my Chaplin book. Thus, seeing the station documented so vividly in the Sinatra film was a revelation for visualizing how Charlie had used the same setting thirty years before Frank. Charlie (left) runs beside the Saugus station, more fully revealed in the Suddenly frame, and as it appears today at its new location. Color images by E. J. Stephens. The Southern Pacific Saugus Train Station was originally located on the east side of San Fernando Road, just south of Drayton Street in what is now called Santa Clarita, a few miles east of the Six Flags Magic Mountain amusement park, about 40 miles from downtown Los Angeles. 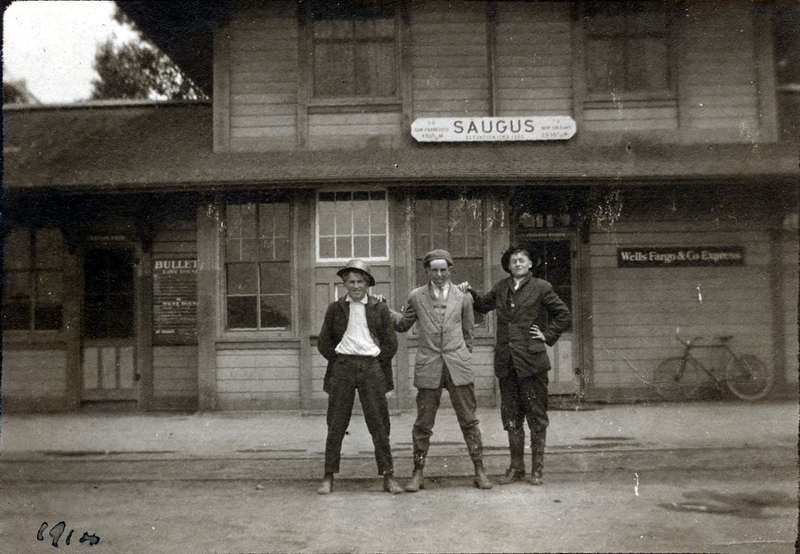 Henry Newhall named the station after the Massachusetts town “Saugus” where his father was born. The station was dedicated in by California Governor Washington Bartlett and Southern Pacific president David D. Colton. I write in my book that the dedication took place September 1, 1887, while historian John Sweetser posts at the Santa Clarita Valley history site SVCHistory.com that the opening was reported in the June 22, 1888 Los Angeles Daily Herald. The station as it appears in Suddenly and at its new home. E. J. Stephens. SCVHistory.com, collection of Alan Pollack. 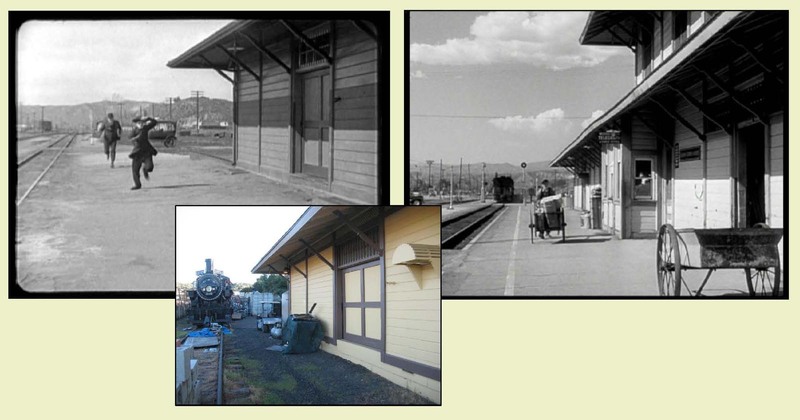 The depot was saved from demolition in 1980 when it was relocated three miles south to the Heritage Junction Historic Park, operated by the Santa Clarita Valley Historical Society, at 24107 San Fernando Road in Newhall. The park sits adjacent to the William S. Hart Regional Park, containing the former ranch and mansion of the famed silent film cowboy and movie director. The Saugus station (at its new setting) appeared more recently in The Grifters (1989) starring Angelica Huston, Annette Bening, and John Cusack. The station’s placement in its new setting now makes the “front” of the station less accessible than the back. As I explain in my book, Chaplin continued filming The Pilgrim in Pasadena, using both the Raymond Station (left), and the Raymond depot – part of the Raymond Hotel (right), both lost to history. You can read more about the filming of Suddenly in Saugus in Robby Cress’s entertaining and remarkably broad-ranged movie and television location blog Dear Old Hollywood. Charlie cools his heels near where Sterling Hayden converses with a group of Secret Service agents. My thanks to E. J. Stephens, noted Hollywood historian, author, lecturer and tour guide, and co-host, with Bill West, of the SCVTV movie series “SCV In the Movies,” for providing the color photos. You can find E. J.’s books about early Warner Bros, early Paramount Studios, and Griffith Park, at this link. All images from Chaplin films made from 1918 onwards, copyright © Roy Export Company Establishment. CHARLES CHAPLIN, CHAPLIN, and the LITTLE TRAMP, photographs from and the names of Mr. Chaplin’s films are trademarks and/or service marks of Bubbles Incorporated SA and/or Roy Export Company Establishment. Used with permission. Suddenly (C) 1954 Libra Productions, Inc. The Saugus station at its new home, 24107 San Fernando Road in Newhall. 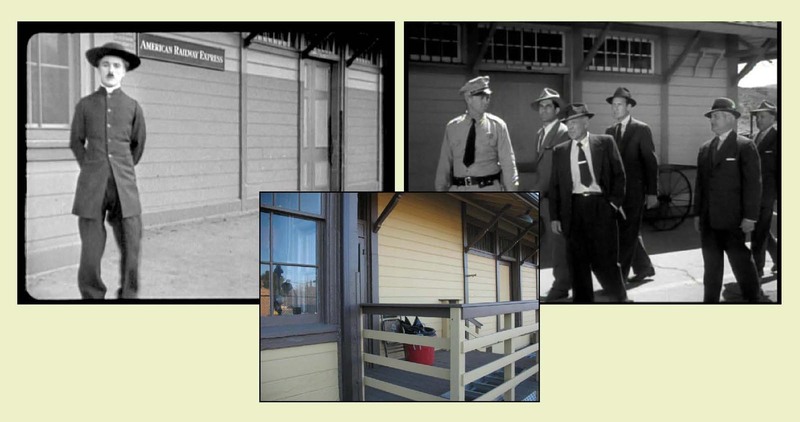 This entry was posted in Charlie Chaplin, Film Noir, The Pilgrim and tagged Chaplin Locations, Chaplin Tour, Charlie Chaplin, film noir, Frank Sinatra, Heritage Junction Historic Park, Newhall, Saugus, Saugus train station, Silent Comedians, Silent Movie Locations, Sterling Hayden, Suddenly, then and now. Bookmark the permalink. Another fine look into the past and how two movies used the same locale from different points of view. Thanks for another interesting article.